The Resident Tourist: Hill Country Live . . . Since dating Scott I've gained a new appreciation for karaoke and Texas BBQ (some of his favorite "pastimes"). 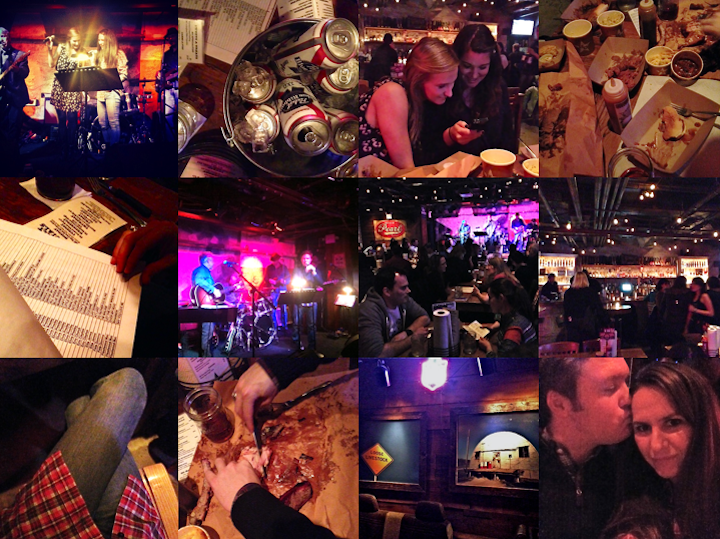 So in an effort to kill two birds with one stone, a group of us gathered at Hill Country Barbecue Market for a night of messy meat and live band karaoke. Every Tuesday night Hill Country invites its diners to jump up on stage for karaoke backed up by a full band. It's entertaining, intimidating, and over all a great time! We ate and sang and drank and danced, cheering each other on, snapping pics and taking videos. We had so much fun, we vowed to return and work our way into the group of regulars, which there were so many of. And food-wise, I have to say the BBQ was fantastic. Well up to par with what I've had in Texas, definitely the best I've tried in NYC, and even the real Texan approved. They don't spare an inch of authenticity, which I loved. Our food was wrapped in paper, our beer poured in mason jars, our fingers serving as the best form of utensils.